In stock 161 pcs. Also available in our walk-in store. 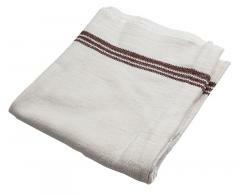 A proper traditional military towel, a perfect choice for the kitchen, bathroom or for travel use. These things are virtually indestructible, made from strong cotton. Dimensions approx. 50 x 90 cm. Used military surplus, still in good condition, almost new.